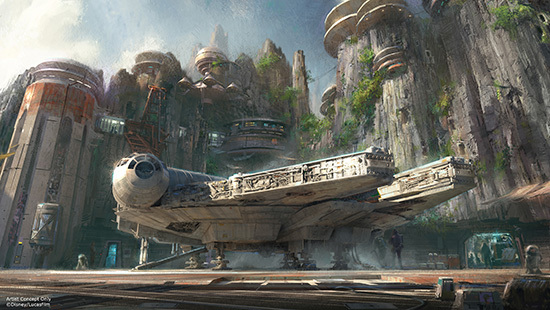 Rumor: New Details About the Upcoming "Star Wars Land"
Among the many Star Wars things to be excited for in the next couple of years, near the top of the list is the upcoming "Star Wars Land" theme park coming to Disneyland in California and Disney World in Florida. The park was announced back in August 2015 at the D23 Expo, and since then details have been sparse. Our friends over MakingStarWars.net have gotten their hands on some of the attractions we can expect to see when the park opens in a few years. All of that sounds very exciting, it's cool to hear that content from both Episode VIII and Rogue One will be included. Hopefully "Star Wars Land" is something that is constantly being updated to better reflect the evolving Star Wars universe as more films, TV shows, comic books, novels, and video games are released. Yeah, yeah. Falcon flight simulator. But I'd rather tour the ship than pretend to fly in the cockpit. I agree. Star Tours gets me motion sick enough already! It's all about the speeder ride. Be it bike or large multiple seat version, it would be a fun outdoors ride.